I Googled for this, and founded some people getting the same trouble, most of them are ENB's or perk tree alteration's Mod-Caused. 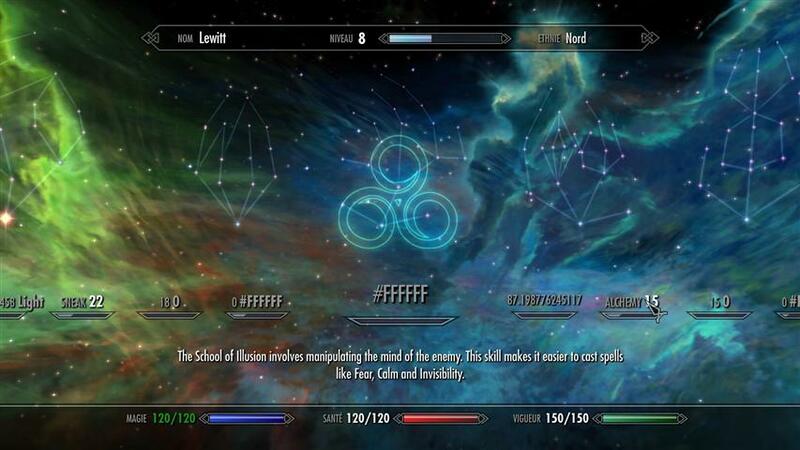 so i uninstall each one mod and reinstall it trying to find the cause, and found the cause was the HiAlgo Boost itself, While i ran skyrim without hialgo boost active, the Perk Tree finally Show with full functionality but, when i runskyrim with Boost, we go back to the same. this is the first report about black screen on perk trees menu screen. (If have read the link about missing Statsmenu.swf; does not seem related to BOOST or to the black screen). Thanks for posting! It would be nice if you can post a screenshot or better description of "a black screen, it shows the transition of upper fade, but keeps on black screen", I do not exactly understand what you mean. Also, if you can find a way for others to reproduce the problem. Meanwhile, there is a simple workaround: you can press F10 any time in the game, to toggle BOOST on/off. So, you can turn it off when in the perks screen. Sorry for my english, what i mean to say is when you get into the perk tree menu in-game, it get stucked into a black screen, and doesn't show the perk tree screen. thanks QRnt, i also have more bugs glitches that i'll appreciate your help to solve them.